Forester and arborist Terry Fenton won two prizes in the prestigious Royal Agricultural Society of England / Royal Forestry Society, Woodlands & Plantations Competition. This national competition rewards woodland owners and managers for high standards of woodland stewardship, and is organised on a regional basis, 2002 being the turn of Hants, Glos, Wilts & the Isle of Wight. Terry Fenton receives the Tubex Trophy from HRH The Duke of Gloucester on behalf of Mr Hope, Court Farm, Witcombe, Gloucester. In the judges report Terry was singled out for special praise in creating the winning entry in the ‘Plantations 5-20 years’ class. The 17.4 Ha ‘Sophie Hope Plantation’ at Witcombe, Gloucester, was one of 17 entries in this class and for the judges really was “the icing on the cake”. Planted in 94/95 the woodland was designed to produce utilisable timber, provide an attractive amenity for the local population and enhance the biodiversity, and is already achieving all its objectives. “The almost single handed work of Terry Fenton is remarkable and deserves the highest praise”. Terry receives a certificate on behalf of the Trustees of Stinchcombe Hill Recreation Ground Trust. 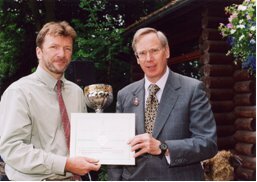 He was also ‘Highly Commended’ for his work in securing Ash Natural Regeneration in the woodlands surrounding Stinchcombe Hill on the western Cotswold escarpment. In 1988/89 poor quality mixed broadleaves were felled, occasional seed trees retained and the prolific regeneration re-spaced. 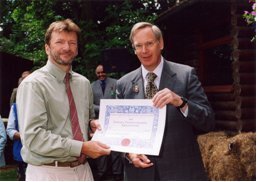 Terry received certificates on behalf of his clients from HRH the Duke of Gloucester at an awards ceremony at the Royal Show.